A Circus Impresario Extraordinaire, Papa Boneshaker promises the love of his life, Penny Farthing, the gift of flight. 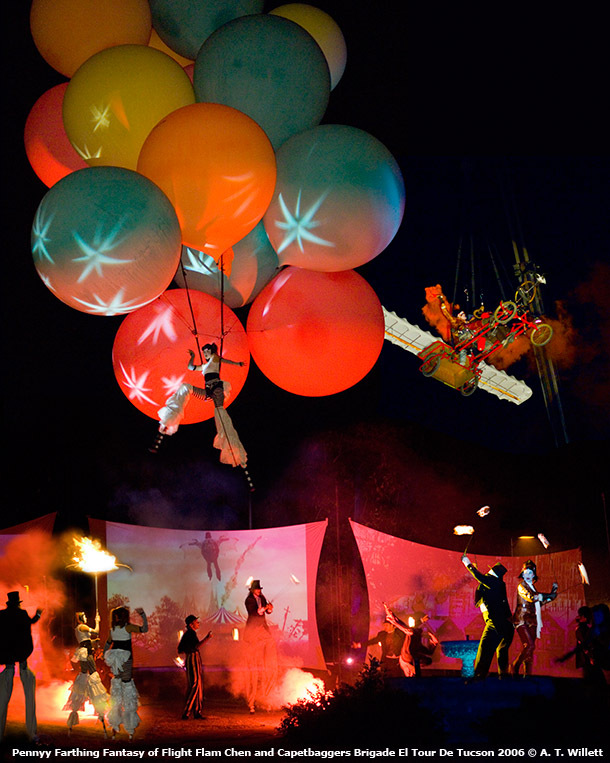 Bursting at the seams with surprises and splendor this full length multi-media spectacle of colorful creation between collaborators Flam Chen and The Carpetbag Brigade takes a simple circus love story to the sky and beyond. Pyrotechnic wizardry, choreographed acrobatic stilts, enchanting aerial dance, a bevy of mischievous clowns, flying machines, weather balloons, a metaphysical marching band, and a gypsy orchestra set in a Victorian atmosphere fulfill the circus-going desires of spectators from the age of 2 to 101. Playable in a variety of settings Penny Farthing’s Fantasy of Flight can be mixed with special events in which the audience, or local performers participate in full Victorian dress. Under pre-arranged conditions helium balloon rides can also be offered to selected audience members in the post production time. Penny Farthing’s Fantasy of Flight has very specific technical considerations and requires consultation and dialogue with our technical managers.